Door Tech was contacted about this garage door repair in Annapolis, MD. The homeowners were concerned and asked us how to fix a crooked garage door. In such cases, a series of different malfunctions could be the source. 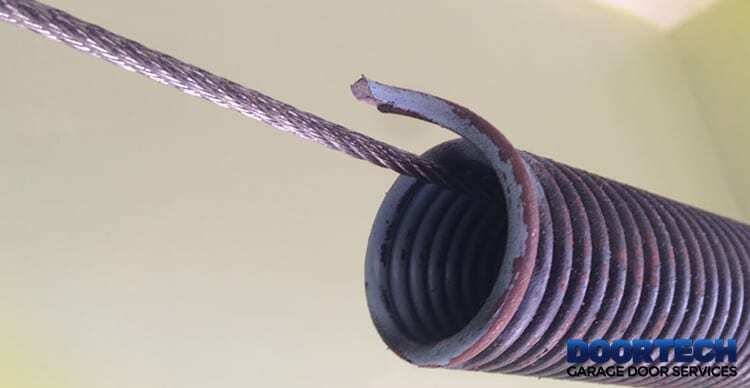 Upon thorough inspection, our technician discovered an issue with both the springs and the cable, what the industry commonly refers to as jumped cables. The cables attach at the bottom brackets on the bottom corners of the door and run up and back to the springs. This situation can be caused by the door hitting an object or stored items near or around the door track. The homeowners were smart and called a professional as this condition can be very dangerous. When he arrived, the door was crooked and in the up position. Note: NEVER try to pull the door down manually. If a door is crooked in the up position, it could cause more damage because the top of the door will try to pop out of the track and can even fall unexpectedly. The first step was to take the door apart piece by piece, carefully, like when installing a new door. The tracks were inspected and were also undamaged. The springs were worn and had to be replaced. Luckily the cables were still in excellent condition and needed only adjustments. Calling a professional that you can trust is paramount. A dishonest technician could have sold the homeowners new tracks and a new cable. Door Tech always inspects every component of the door and the opener. We will only replace worn or broken parts. Our team prides itself on our ethical practices. You can expect only the best when you call on us. That is our philosophy. If you are experiencing any issues whatsoever with your garage door contact us. Like this garage door repair in Annapolis, our team will always start with a complete assessment of the condition. Then, the technician will prescribe the best course of action, addressing only what needs to be fixed. You can trust us to repair or replace your garage door using the very best practices.